Given the PI's background in industrial research in large scale water and wastewater treatment, we are very interested in improving current advanced separation systems used in the process, water, energy, and biotech industries with a heavy focus on industrial and municipal water reuse and desalination with a goal of making urban water cycles more sustainable. We contend that membranes are the key technology for closing the modern urban water cycle and conduct a large fraction of our work in the area of synthetic and bioinspired membranes. 1. A detailed investigation into the chemical transformation of the chemical polyacrylamide used extensively in "slickwater" hydraulic fracturing and its potential downstream impacts on the treatability and recycling of this wastewater. This work was published in Environmental Science and Technology and can be found here. 2. A simple and easily implementable technique for simultaneously eliminating fouling and reducing concentration polarization in reverse osmosis membrane modules used for water recycling and desalination using reactive membranes. This work was conceived by Raj Guha as a part of a class project! It can be found here. This project has now been funded by the National Science Foundation with support from Dow Chemical. 3. A study on understanding transport in aquaporin 0, the “slow” water channel present in mammalian eyes, and demonstration of a 40x increase in transport rates using only two key mutations. This is an interesting breakthrough as these proteins can be arrays in flat two dimensional crystals that may be able to be processed into membranes (subject of an ongoing grant). This paper can be accessed here. September 2018: I have been somewhat lax in updating this website but a number of great things have happened in the group. 1. A number of pending papers have been finally published. Check out our Google Scholar profile for updates. 2. Our group and group alumni were very involved with the Gordon Research Conference on Membranes. Manish was chair of the GRC and Yuexiao and Boya (alums) were chairs of the GRS. 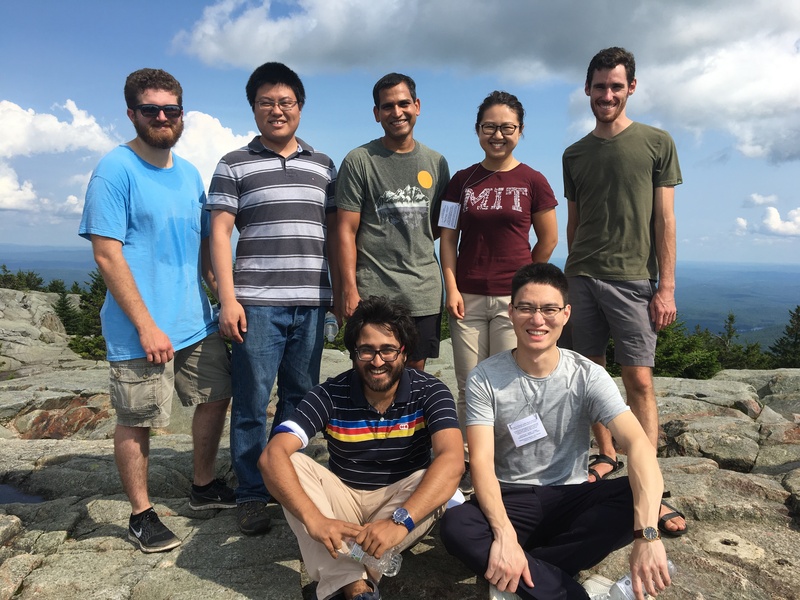 Here is a picture of Kumar group students and alums on a hike. 3. Manish and Woochul attended the Faraday Discussions on Artificial Water Channels. Manish was Deputy Chair. It was a unique experience. The new volume on all the papers that were presented and discussed are out. Check it out here. 4. The department had written a story about our work on artificial water channels including some information on the artificial water channels meeting. It can be seen here. August 2018: Tyler's paper on the microstructure of reverse osmosis membranes determined using electron tomography is online in PNAS. This work was conducted in collaboration with Dow Water and can be seen here. A news story on this paper can be found here. June 2018: Our paper on redesign of the OmpF membrane protein to target (any) precise pore size between 3 and 10 Angstroms was accepted today for publication in Nature Communications! Congratulations Ratul and Tingwei on this fantastic piece of work. Paper # 14 for the year. June 2018: Our paper on the first macro-scale membrane created using artificial water channels is online. It can be accessed here (open access). Congratulations to Yuexiao and Woochul! 1. Yuexiao and Woochul's paper on making a macroscale membrane with PAP5 artificial water channels is in press at Nature Communications. 3. A review on Artificial Channel based Membranes led by Woochul was published in Annual Reviews of Materials Research and can be accessed here. February 2018: Patrick, Megan, and Emelia's paper in Energy and Environmental Science has been highlighted by EES Editors as a HOT manuscript in 2017. See the entire collection here. I have to say I am pleasantly surprised. This massive review was put together in 3 months! January 2018: Boya's paper on Moringa oleifera cationic protein (MOCP) enhanced sand filters for sustainable water treatment was highlighted in a beautiful cover on ES&T Letters and in a article in the C&EN magazine from ACS. November 2017: We have had three new papers accepted/in press in the last few weeks. 1. Boya's paper on making sustainable filters with moringa seed extract was published in ES&T Letters and can be read here. It provides design guidance for these filters. It took a record 3 weeks from submission to being online! 2. Boya's paper on chemical transformation on polyacrylamide used for hydraulic fracturing was finally accepted after a very long period of review (~ 11 months) in ES&T. It is here. 3. Ben and collaborator Margaret Kowalik's paper was finally accepted into RSC Advances and can be read here. This paper has been 5-6 years in the making. October 2017: Three new graduate students join the group. Welcome Mike Geitner, Yu-Ming Tu, and Charan Samineni! Watch for their profile on the people page (coming soon). October 2017: Manish receives an "Excellence in Review" award from ES&T Letters. Reviewing is not always a thankless activity! See announcement here. September 2017: Our group is included in the "2017 Class of Influential Researchers" by I&EC Research. Hasin's artwork graces the cover of this issue! Check out the announcement here. August 2017: Manish receives the Della and Rustom Roy Award in Materials Research from the Materials Research Institute. This award is very meaningful for Manish as it is named after Professor Rustom Roy, a giant in the field of materials and co-founder of the Materials Research Society (MRS), and a native of Manish’s home state of Bihar in India. July 2017: Manish receives tenure in the department of Chemical Engineering at Penn State. June 2017: The Kumar group had a good AEESP (American Association of Environmental Engineering Professors) Conference in Ann Arbor, Michigan. Manish won one of the two non-student best presentation awards based on our work on probiotic biofilms to prevent membrane fouling! Boya and Yuexiao attended the conference as well. June 2017: Tingwei's first paper is online in the new journal from Wiley, Advanced Biosystems. This is a paper our group has been working on for years and deals with defining compatibility between polymers and membrane proteins. Check it out here. June 2017: Raj Guha and Ben Schantz defend their PhD theses. They are the fourth and fifth PhD students graduating from our group. Congratulations! May 2017: Our group receives two new NSF grants. See details here and here. May 2017: Boya is featured in a video produced by the CEE Department at Penn State. Check this video out here. April 2017: Kumar group undergraduate researcher and Schreyer Honors Scholar Elsa Koninckx is student marshall for Chemical Engineering. See news item here. We are very proud of her! April 2017: Both Cory and Megan win the Pennsylvania Space Grant Graduate Scholarship! April 2017: Tingwei wins multiple accolades. She recently received the Air Products Graduate Fellowship which includes a summer internship at Air Products and a full year of funding! This is a highly sought after opportunity in our department. Tingwei also placed first in the College of Engineering Research Symposium poster competition! April 2017: Kumar group undergraduate researcher John Brezovec has won a DAAD RISE scholarship to conduct research in Germany for 3 months this summer. He will be working at the Max Planck Institute of Colloids and Interfaces in Potsdam. He will be working on Giant Unilamellar Vesicles. March 2017: Megan wins the NSF Graduate Fellowship! Also, Kumar group undergraduate researcher, Kevin Shebek who is now at Northwestern, receives honorable mention. ​March 2017: Our paper on the permeability of the eye lens aquaporin, AQP0, and mutations for increasing its permeability 40x is online on the Biophysical Journal website. Check it out here. It was also featured in a "slider" on Biophysical Journal's home page! It will be available here for a few weeks. February 2017 (updated! ): Our paper on polymer exchange in detergent micelles studied using Small Angle Neutron Scattering (SANS), relevant to incorporation of membrane proteins in block copolymers, was accepted for publication in Macromolecules after a year of repeat experiments and revisions. Congratulations Ben and Patrick and thank you to collaborators Kyle Bishop (Columbia) and Paul Butler (NIST). Here is a link to the paper. February 2017: Manish had a wonderful visit to Taiwan with the Industrial Technology Research Institute and National Taiwan University. Thank you to Daniel Tai (ITRI) for hosting me, it was a wonderful experience. Also thank you to Allan Tung for hosting me at NTU and arranging for the seminar. It was great to see so many bright students. We look forward to collaborations in the near future. February 2017: Two undergraduate education related papers based on our collaborative work were accepted. They are listed below. Watch this space for links. 1. Follmer DJ, Zappe SE, Gomez E. & Kumar M. (2017). Student outcomes from undergraduate research programs: Comparing research experiences for undergraduates (REU) models. Council on Undergraduate Research Quarterly (accepted). 2. Follmer DJ, Zappe SE, Gomez E. & Kumar M. (2017). Results and Implications of a Three-Year Evaluation of a Research Experiences for Undergraduates (REU) Program in Chemical Engineering. Chemical Engineering Education (accepted). January 2017: Chao Lang joins our group as a postdoc. Chao is an expert in synthetic channel synthesis and completed his PhD at Jilin University. Welcome Chao!. Check out Chao's impressive profile on our People page. December 2016: A paper that Manish, Tyler, and Yuexiao wrote as a part of Manish’s invited presentation at the National Academy of Engineering Frontiers of Engineering Conference (2016) was selected for publication. This article was published in the winter edition of NAE’s quarterly “The Bridge”. It can be downloaded at this link and is titled "Water Desalination: History, Advances, and Challenges". This is indeed an honor for our young group! November 2016: Penn State Materials Research Institute recently published their quarterly magazine "Focus on Materials" with the theme “Water”. Several of our collaborations including those with Andrew Zydney, Stephanie Velegol, and Chris Gorksi were highlighted. Our lab was featured as well. Check it out here. November 2016: Our review paper on biomimetic approaches for linking redox proteins to electrodes was accepted by Energy and Environmental Science and is online. Great job Patrick, Emelia and Megan! I still cannot believe you guys put this very detailed paper together in 2-3 months. You can check out the accepted manuscript here. October 2016: Our proposal to host a Faraday Discussions conference on Artificial Channels has been accepted. These discussions are important gatherings of experts in a research subspecialty and shows the growing influence of a particular research area. See more details in this cool video here. Collaborator Mihail Barboiu will be the chair and Manish will be the Deputy Chair. October 2016: Four new graduate students join our group. Welcome Cory, Derrick, Rebeca, and Woochul! Read about them on the People page. September 2016: Our collaborative paper with the Zimmer, Nixon and Bulone groups showing that a single isoform of plant (poplar) cellulose synthase is sufficient for cellulose microfibril formation was published in PNAS! Read it here. September 2016: Patrick's paper on PSI in block copolymers and on block copolymer conductive interfaces linked to electrodes is published in Journal of Materials Chemistry A (after a long journey). Read it here. July 2016: Several members of our lab visited the exciting Gordon Research Conference on Membranes: Materials and Processes. Manish was a vice-chair of the GRC and Patrick was the chair of the GRS. Boya won first prize in the poster competition and Yuexiao gave an outstanding selected talk! Manish will chair the 2018 GRC. Yuexiao and Boya will chair the student section of the GRC (GRS). See details of the 2018 GRC here.